As a small business owner, you understand how complicated running a business is. 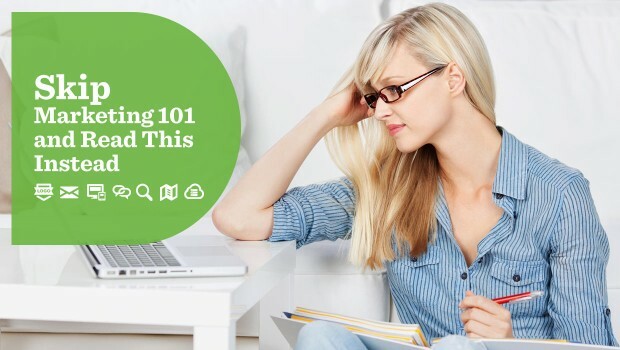 You’re the chief operating officer, bookkeeper, recruiter, trainer, top salesperson, office manager, and head of marketing — which is why you don’t have time to sit through a Marketing 101 class. 1. Not marketing is not an option. No matter how great your product or service is, it won’t sell itself. You’re going to need some advertising, promotions, publicity, email, or social media, and most likely a combination of all those things. Not sure where to start? A good rule of thumb is to look at what your competitors are doing and where they’re doing it. Is your chief competition advertising in the local newspaper? Are they all over Facebook? Have they totally missed opportunities on Twitter? Are they under-utilizing their website? Identify channels where you’ll need to go head-to-head, and look for opportunities your competition may be missing. 2. Online display advertising can have a big impact for little cost. Your budget is probably as tight as your schedule, so it’s important to get the most impact for each dollar you spend. Online advertising is a great option for small businesses because it can achieve widespread distribution for less money than you might spend on traditional ad channels like radio, TV, and print. Check out our blog on choosing the right display advertising network to learn more about online advertising. 3. Play on people’s love of events. Buzzwords like “experiential marketing” may make it seem like this is something new, but marketing with events like in-store promotions has been around for as long as there have been brick-and-mortar businesses. That’s because promotions and events reward the people who are already coming into your store, and draw in new customers who may be shopping with you for the first time. Events like ribbon-cuttings, fundraisers, and customer appreciation days help build awareness and brand visibility. Plus, events play on one of your core strengths as a small business — the face-to-face interactions that your customers just can’t get from a mega-business. Read our blog on ways to promote your small business event. 4. Make the most of your website. It goes without saying (or it should) that you have a company website. But if it’s only a glorified business listing, you’re missing out on one of the most powerful, cost-effective tools for marketing your small business. An engaging website not only gives current and potential customers important information about your business — such as your location, hours of operations, products, and services — it can be a vibrant sales portal and a channel for gathering customer data. Your website is far too important to have an amateur look or feel, so have your website designed by a professional. 5. Email marketing is the new direct mail. In the old days, a small business would either pay big bucks to purchase a mailing list and have a direct mail piece professionally designed, or spend countless hours to generate the list and piece themselves. Either route could prove fruitless if the piece was poorly designed and the list was inaccurate or irrelevant. Email is far more cost-effective than the old ways of doing things. Free email tools like VerticalResponsemake it easy to design professional, effective, and mobile-responsive emails, compile and manipulate mailing lists, sign up new email subscribers through your website, and track results. 6. Social media is the new word of mouth. Social media has made it easier than ever for customers to praise or criticize your small business. What’s more, social media has created communities of like-minded consumers where shareability amplifies the value of your marketing messages. Even better — you don’t have to pay to reach your customers via their favorite social media platforms. Yet it’s also important to strategize your social media campaigns so that you’re reaching your target audience with relevant information through their preferred channels. Check out our blog for useful tips on how to expand your social media presence. 7. Win with loyalty rewards. Nearly every company seems to have a loyalty rewards program these days, so it’s easy to forget that the concept originated with small businesses. When the local baker slipped an extra cupcake in your mom’s order, or the florist threw in a pretty vase because your dad always bought flowers there — that was loyalty marketing! As a small business owner, you’re uniquely positioned to maximize the value of a loyalty program, because you’re already building loyalty in face-to-face interactions with your customers. Starting a rewards program can be as simple as offering a punch card that rewards shoppers with merchandise after they fill the card. The key is to give customers relevant rewards and make it easy for them to earn those rewards, so they’ll always have a reason to come back. 8. Build a network of relationships. When you’re wearing your sales hat, you’re probably thinking “always be closing.” When you’re acting as chief financial officer, you’re thinking about minimizing costs and maximizing profits. Whatever hat you wear at any time of day, you should always be building a network of relationships with your customers, other businesses, and other business owners. Joining and participating in local networking organizations is a great way to build professional relationships with other businesses, such as by offering a discount to workers at nearby shops. Or send a stack of coupons to the HR department of the area’s biggest employers and suggest the coupons be used as performance rewards for their employees. You could spend a lifetime educating yourself on how to market your small business — and maybe down the road you’ll even have time to take that Marketing 101 class! For now, however, these eight strategies will help you create a solid base for your small business marketing efforts.